In one corner of the cellar was a bricked up arch. This was facing Church Street, newer bricks than the wall. It was about 4ft high. We always thought it might be part of the supposed tunnels mentioned in Cornelius Brown's History of Newark and recently in Ghosts & Legends of Newark by Rosemary Robb. 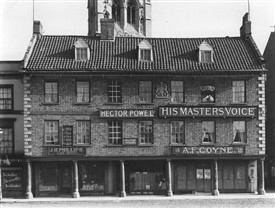 Old maps show two rows of building here, and the bricked up doorway might just have lead to cellars of long gone buildings, but when I think how many times the roads have collapsed at the corners of Middlegate, Kirkgate, Barnbygate and Cartergate in my life and we are told “Its only the sewers”, is it? I think of the tunnels. 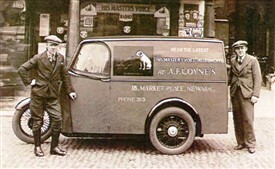 Above: Coynes' first motorised (3-wheeled) delivery vehicle. 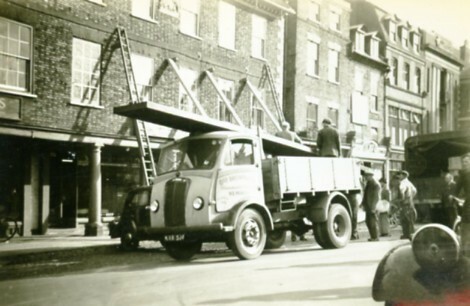 Pictured outside the shop in the early 1930s are my uncle Jack Maidlow (left) and Len Coyne on the right. The van was painted in Sherwood Foresters colours - green with red panels and gold lettering. 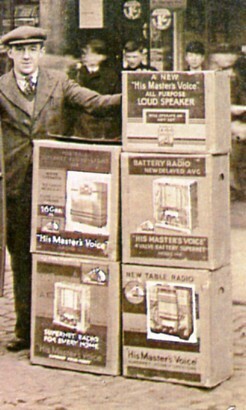 The picture left also shows Len Coyne in the early 1930s beside a selection of 'brand new and boxed' His Master's Voice table-top valve wireless sets. One top of the pile is a box containing a separate 'all purpose' loudspeaker. Stone steps lead from cellars to the ground floor and shop area. When I was young it was full of records and musical instruments hanging above counters which were full of strings for violins, reeds for saxophones, mouth organs etc. 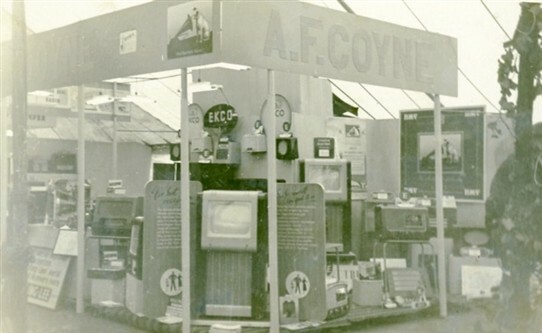 Our stock changed over the years to TV, radio, cycles, electrical toys, hardware and even ice creams and sweets. Many people would know my Grandma who had a leg iron and because she was restricted by this, she sat on a stool taking cash at the till. 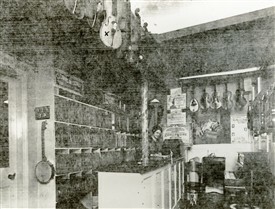 Most of the family could teach music and there was an audition room which later became an area for records and toys. 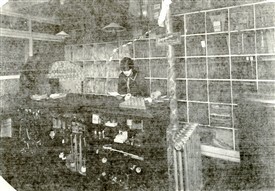 One thing that was still there in the late 1950s was a bell push and sign which gave the numbers of rings for each member of staff who had to stay in the back room until granddad called them forward - all ‘properly dressed’ of course! 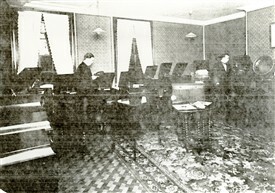 Len Coyne's "Selectra" Band c.1930 pictured in what became the Coyne family's living room on the first floor of the Moot Hall. 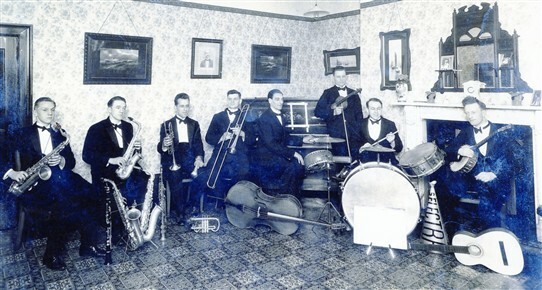 Photographed in a room above the shop, the picture shows Len Coyne (second from left) and Frank Coyne on drums. Arthur Coyne is 4th from left. Note the loud-hailer (next to the bass drum) which was used by the vocalist in these days before microphones. 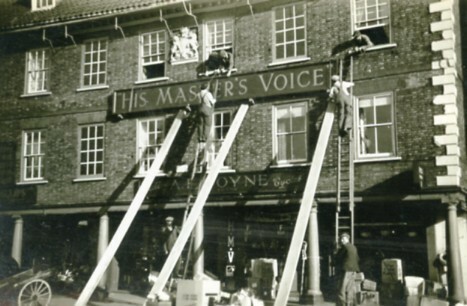 The two photos above show the removal, in 1954, of the large 'His Master's Voice' sign which adorned the front of the the shop for many years. We had to take the sign down because of objections over intrusive sinage on shops in the Market Place. Next door was George Porter No 19 (now Thomas Cook). They had a board on the wall advertising Pills and Potions (now in museum). "Pink pills for Poorly People" was my name for it, many courting couples used it to lean against, including me, over the years. Porters sold most things loose not pre-packed. This page was added by Anne Coyne on 12/05/2011. I live in the south of England and I'm researching my family tree, obviously living so far away means it is more difficult to research the Nottinghamshire area so I am wondering if any members may be able to help me. The family I am trying to find out more about is the Coyne family. They were living in March in Cambridgeshire in the 1800's and then some of them appear to have settled in Sleaford, Newark, Normanton and probably the surrounding areas. 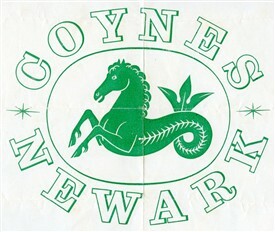 I am particularly trying to contact Bill Coyne who lives in Newark as I know he has information on the family. The other person I would like to know more about is Stanley Frank Coyne a Major in the Sherwood Foresters he died in 2003. I'm hoping someone will be able to help. Dear Ann I can put you in touch with Bill Coyne as he is my father. We have a contact with the Derbyshire Coynes as well so perhaps that will help. I will send my contact details to the web admininstrator for your attention. Nice to know about a new relative. my father was stanley frank coyne - major in the Sherwood Forresters and born in sleaford - he was brought up near to Belvoir castle by his maternal grandmother and Grandfather - family name Smart - is this the person you were enquiring about - is so please contact me or leave a message for further info. kathleen clements (nee Coyne) This page was added by Kathleen Clements on 17/08/2012. Hi kath My mum was born in 1925 at Harston. Near to Denton and knipton. Please use my personal email that I have given to the editors, as I do not want to give personal information out on a public site. I have given the editors permission for them to give you these details. It was equally a shock for my mother. Ann my mother has asked me to try and get in touch with you again regarding my grandfather Stanley Coyne.Could you send me your contact details please ? Hello there. 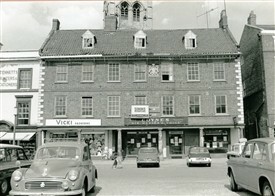 I am writing a book about the history of record and music shops in Newark. I am thrilled to stumble across this fascinating page. Would it be possible to get in touch with anyone who worked at Coynes Music Shop please? Many thanks. I have only just revisited this page ans see that there is a message for me to contact Steve Clements that was left on 18/12/2013. Could you please forward my contact details onto him please. I've just come across this page as I am about to visit Newark this week. I grew up in March and my grandfather was Harry, Arthur's brother. Stanley was my uncle and my mother's half brother. 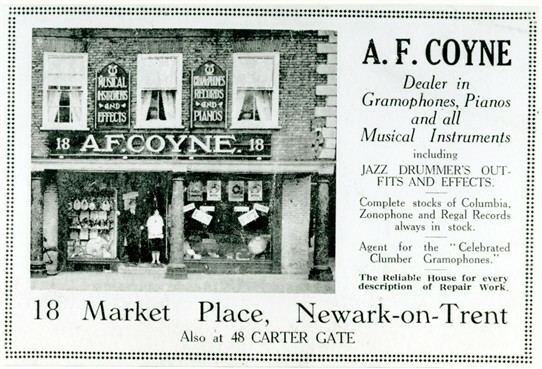 My mother (nee Sylvia Coyne) is still alive (95) and she often talks of her Uncle Arthur having 2 music shops in Newark. I am trying to compile a family tree and all this information is really helpful.